This year at the SNM 2011 Annual Meeting, Royal Philips Electronics (NYSE: PHG, AEX: PHI) is announcing TruFlight Select, the first economical PET/CT system equipped with time-of-flight (TOF) technology. Although the TruFlight Select PET/CT is designed to serve the needs of facilities with budget constraints, the system is equipped with Philips? premium TOF technology, Astonish TF. Astonish TF is the same TOF technology driving Philips? 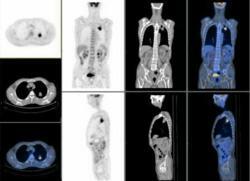 new high-end Ingenuity TF PET/CT and PET/MR systems introduced at RSNA 2010. Astonish TF is now being standardized across the Philips PET portfolio, and Philips is offering our current TOF customers a performance upgrade to the latest version of Astonish TF. TOF technology for positron emission tomography (PET) scanners is designed to enhance image quality by reducing image artifacts and providing higher sensitivity. The resulting images help clinicians better detect and locate lesions to increase diagnostic confidence and preserve healthy tissue during treatment. According to a recent study, TOF scans can help to improve lung and liver lesion detectability. In the study the improvement was more pronounced in heavy patients. Posted on June 11th, 2011 at 12:12 am.